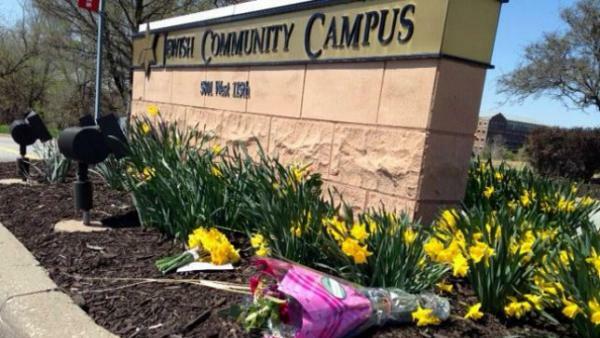 Three people were shot and killed outside the Jewish Community Center of Greater Kansas City and Village Shalom in 2014. After a gunman opened fire at a synagogue in Pittsburgh on Saturday, killing at least 11 and wounding others in what federal prosecutors are calling a hate crime, faith leaders around the country are re-examining security tactics while trying to ensure their religious institutions remain accessible community centers. Protocols differ between institutions, but various organizations, including the Department of Homeland Security, have materials on how to prepare for an active shooter. For the fourth consecutive year, hate crimes are up in major U.S. cities, according to the Center for the Study of Hate and Extremism at California State University, San Bernardino. Though attacks like the one in Pittsburgh are always shocking, the U.S. has a history of anti-semitism, Ezickson says. “We experienced about a 10- to 15-year period of slow decline in the number of incidents of harassment and violence and destruction of property of Jews with anti- Semitic intent or slogans,” Ezickson said. But in 2016, there was a 34 percent increase in anti-Semitic incidents tracked by the ADL, rising towards the end of the year, near the 2016 presidential election. In 2017, the ADL charted a 57 percent increase, with 1,986 reported anti-Semitic incidents. “It was the largest one-year increase in the 40 years we’ve conducted this audit,” Ezickson said. Like Pittsburgh, suburban Kansas City was the scene of a major violent attack on the American Jewish community. On April 13, 2014, an avowed white supremacist from Missouri drove to the the Jewish Community Center of Greater Kansas City — known locally as “The J” — then shot and killed a 14-year-old boy and his 69-year-old grandfather in the parking lot. The man also shot at other people and the building itself before driving about a mile north to a Jewish retirement community, where he shot and killed a 53-year-old woman. None of the three victims were Jewish. Gavriela Geller heads the local branch of the American Jewish Committee, a nonprofit advocacy organization. Her office is in the community center, and Geller said the first person she called Saturday after learning of the Pittsburgh shootings was the center’s head of security. The area’s congregations immediately stepped up their security, which she said included a visible law enforcement presence. And while the sudden presence of security guards could be jarring, Geller said the Kansas City Jewish community is used to it by now, thanks in part to changes implemented in the wake of the 2014 shooting. About 150 people in the Kansas City Jewish community received active shooter training from the U.S. Department of Homeland Security in the wake of the 2014 incident. Before boarding a flight on Saturday afternoon, President Donald Trump suggested that if armed guards had been inside the Pittsburgh synagogue, the shooting could have been prevented. But the ADL’s Ezickson disagrees.